As we welcome December, the end of fall is fast approaching. In fact, there are only 17 days left of autumn. While River Legacy and North Texas in general do not see much traditional autumn foliage, there are a few trees that exhibit some fall hues. By now, most of the leaves have begun to fall to the ground, but there are still some trees with their green, orange, brown, red, or yellow foliage. But, what drives the leaf color change? It has to do with the chemistry inside the leaves and how it responds to seasonal changes. Leaves contain many pigments, including chlorophyll as well as carotenes, xanthophyll and others. Chlorophyll is probably the one most of us are familiar with. This is the pigment that gives leaves their green color. When a plant undergoes photosynthesis, the process by which it creates its own food, chlorophyll takes center stage. It absorbs energy from the sun’s rays to be used in creating this food. As autumn approaches, the temperature gets cooler and the length of sunlight the leaves receive shortens. This causes chlorophyll to break down, making the green color go away. So, leaves are left with the other pigments and these become visible. Carotenes and the other pigments give leaves their yellow to orange colors in the fall. There are other chemical processes at work that add the red hues that are commonly seen as well. Eventually, the leaves break off the tree. Since trees will no longer be able to make their food during the winter, they go into a state of dormancy where their metabolism slows down. It is a process that is very similar to animal hibernation. The trees are not dead during this time, contrary to what it might seem. 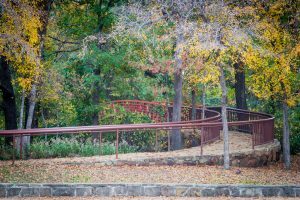 Before all of the leaves fall in a few days, come take a walk at River Legacy to catch a glimpse of some of the beautiful tree color changes in the park and Science Center grounds. River Legacy is home to a wide variety of animals. Though big mammals and such as armadillos, bobcats, raccoons and others are among the most iconic inhabitants of River Legacy, several equally-awesome amphibian species make this park their home. But, first, what are amphibians? Amphibians are a class of vertebrates (animals with a backbone) that are cold-blooded, live semi-aquatic lifestyles, and have a moist and scale-less skin. There are three kinds of amphibians in the world: frogs and toads; salamanders; and caecilians. Here, only two of those kinds can be found – frogs and toads and salamanders. 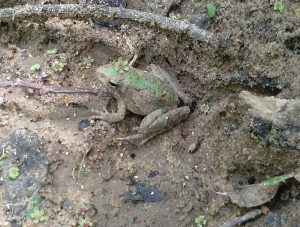 (Hyla versicolor), and the Blanchard’s cricket frog (Acris crepitant blanchardi). Salamanders look like lizards but they are not covered in scales. They are less diverse and common than frogs and toads. One of the common species found in River Legacy is the barred tiger salamander (Ambystoma mavortium). River Legacy is part of the range of other species, but no records have been reported. Visit River Legacy Living Science Center to see the amphibians in our animal exhibits! Why Do Nocturnal Animals Come Out at Night? As with most animal behavior, it comes down to survival. Whether it’s avoiding being eaten by another animal or being able to find food, nocturnal animals have plenty of good reasons to sleep during the day and hunt at night. Many reptiles sleep during the day to avoid the hot afternoon temperatures. 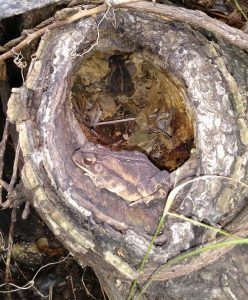 For example, Copperhead snakes spend much of the daytime sleeping under logs and leaf litter. Then they forage for cicadas and small rodents at night. Animals such as mice are nocturnal because many of their predators are out during the day. While there are also predators at night, these small animals have a better chance of going unnoticed as they forage for food and water. During the day they can rest safe and sound within their burrows and at night they can search for food. Some animals also come out at night because their prey comes out at night. For example, owls hunt for mice at night, which also happen to be nocturnal. Catching prey at night can be more difficult, but nocturnal predators are equipped with adaptations like great hearing and eyesight. Animals are nocturnal because there is too much competition during the day. For example, bobcats might hunt during the daylight so coyotes hunt at night. This allows each species the chance to hunt for food without constantly fighting each other. 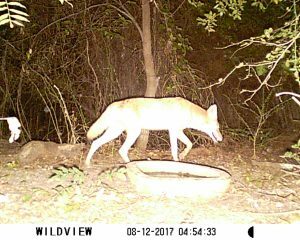 The coyote picture shown above is from one of our night trail cameras at the Science Center which captures still photographs. Trail cameras are predominately used to watch and track wildlife. They are perfect to place in a remote location and see what wildlife is in the area. It is surprising what you will see and how much wildlife is around us at night. This beautiful bobcat was spotted earlier this week near River Legacy Living Science Center. We only got this quick glimpse before it sauntered back off into the woods. Quietly watch or photograph the animal from a distance. Make sure the bobcat has an “escape route” and do not try to corner it, approach it or throw anything at the animal. Never approach a mother bobcat that has cubs. She will try to protect them if she feels you might be a threat. Never feed bobcats or any wild animal. They have plenty of natural food sources (rodents, squirrels, birds) in River Legacy Park. Enjoy the experience! Bobcats are solitary animals with a territory of up to 25 square miles. They are usually well camouflaged and avoid human contact so you are privileged to see this remarkable animal in the wild. The bobcat’s most distinctive characteristics are a tuft of fur on each ear and a bobbed tail. Let us know of your cool bobcat sightings! No alarm needed, just a dose of caution, if you spot a snake on the park trails or even in your own backyard. Like most wild animals, snakes are more afraid of you than you are of them. Just like checking weather conditions and packing enough water are necessary steps to prepare for any outdoor outing, so should being aware of the wildlife you may encounter. The first thing to keep in mind is that these are wild animals, and wild animals need space. If you encounter a snake along a trail, be sure to observe from a distance. Most snakes will move quickly off the path while others might stay as still as possible. If you can, walk around the snake, giving it a wide berth. The best course of action is to leave it alone and observe or take pictures from a distance. Most snake bites occur when people try to pick up, move or kill a snake, all of which are unnecessary. 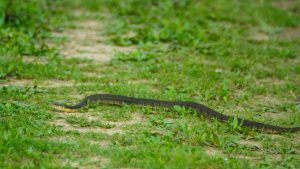 Another way to avoid snake bites is to always be mindful of where you are stepping or placing your hands while hiking a trail that is either paved or off-the-beaten path. Be sure to look where you are walking and never reach down to grab something unless you have complete visibility. 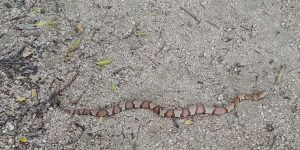 Many snakes, like copperheads, like to bask in the sunlight and can be found doing so stretched across a trail, log, or parking lot. Copperheads are venomous but are not aggressive. Rat snakes are another common snake spotted in this area. Rat snakes are non-venomous, help control the rodent population and have excellent camouflage. They are typically spotted climbing trees or sliding across your backyard or trail. Learn more about snakes common to our area at River Legacy Living Science Center and check out our exhibit of snakes, as well as other wildlife native to River Legacy Parks.